Charity galas provide the perfect opportunity to raise funds for a good cause while hosting an event full of glitz and glamour. One of the biggest challenges faced when hosting this kind of event, however, is balancing what you spend on the event with the need to raise as much money as possible for your charity’s cause. 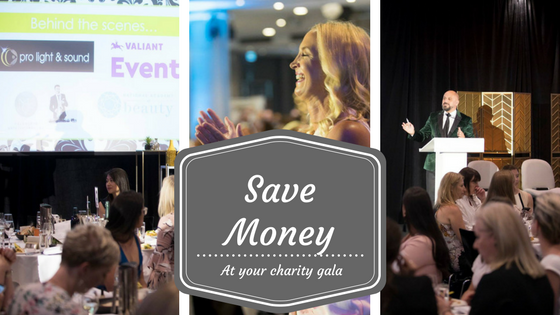 The underlying aim of any good gala is to generate awareness for the charity of your choice, along with raising funds and building relationships with key people in the industry. It can be a savvy business decision as well, but you shouldn’t have to go into debt to pull it off. Find out how to save money on your next big charity gala with these tips. One of the easiest and best ways to save money when you’re planning your gala is by hiring as much of your equipment as you can, rather than buying it outright. Hire AV equipment, lighting and audio systems to enhance your venue and make a significant impact on your guests without draining your bank account. Buying these professional systems is not only costly, but will leave you in ownership of a range of technical products you may not need once the event is finished, so it makes much better business sense to rent these out from the experts. Even better, you can have them installed and operated for you, saving valuable time and energy. No party is complete without a plan, and your gala’s plan should have a comprehensive budget. This should include all expenses before, during and after the event, including hiring staff, making and sending invitations, renting a venue, entertainment, food and drink, transport and all those other bits and pieces that can add up to create a significant bill. Think about what’s most important at your event and allocate more of your budget accordingly to those areas. For many events, this may be the entertainment and catering, though you can save money by suggesting guests travel to the venue via public transport. You could also ask for volunteers to staff the charity event. Make sure your budget also outlines your fundraising goal so you have this in mind as you plan. If you are planning your next charity event, get in touch with Pro Light & Sound. You never know, we may just sponsor your event to help you achieve your fundraising and glitz & glamour goals.